I have so much I want to cover this week so I am going to get right into it. It is the end of the month and I want to give you something new to try. I also had a question that came up during the week about asparagus soup and finally I have a tip to share. When I first wrote about trying something new, I said that recipes don’t have to be difficult to have the wow factor; making your own marinara sauce falls into this category. I know quite a few women, who make their own sauce on a regular basis. A mother or grandmother or even an auntie taught most of them. Even Clemenza taught Michael Corleone how to make sauce. The recipe that follows has a lot of wow factor for small effort and if you put in a little more effort you can really amp it up. The recipe calls for a 28-ounce can of plum tomatoes. Use the San Marzano’s. They have a sweeter and richer taste. Further down the recipe calls for a chopped, sweet red bell pepper. 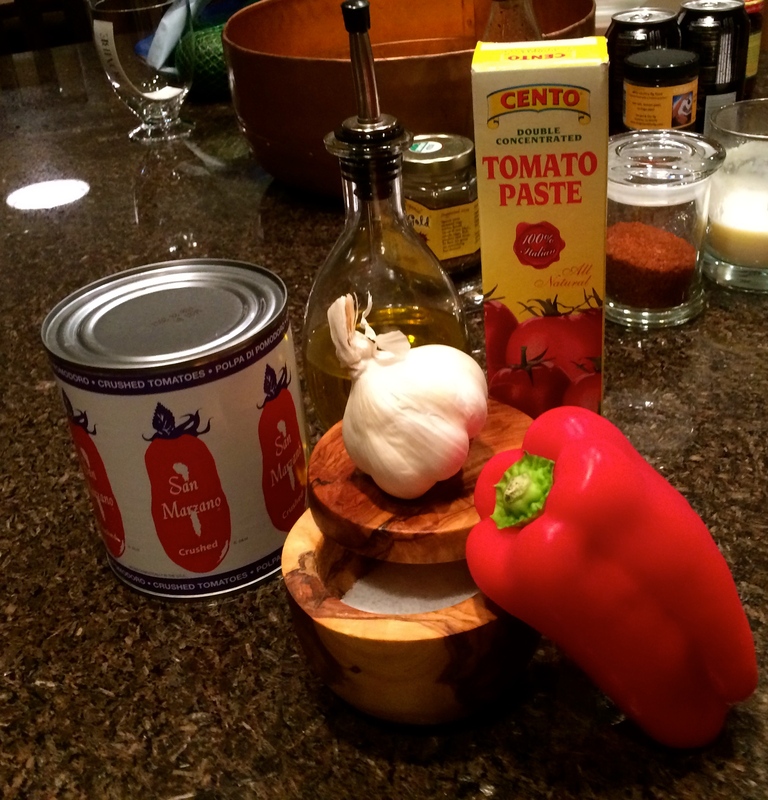 Try using a roasted red bell pepper. It will give your sauce a richer depth of flavor. I promise to post several easy methods for roasting peppers; for now just use a raw bell pepper or store bought roasted. I was at dinner with some friends and was asked about why one’s asparagus soup had turned brown. The flavor was good but the brown color left it less appealing to the eye. Why did that happen? I immediately went to lemon. Had she added lemon to the recipe? This will sometimes stop the browning process. She had. Had she used an aluminum pot? Acid will interact with aluminum and cause discoloration. Nope, the pot was ceramic. I turned to my foodie gurus from my writing class. What we came up with was to try blanching the asparagus before you use it in the soup. This process uses boiling water to submerge the asparagus just long enough to see that bright green color appear, then submerging the asparagus in ice water to stop the cooking process. The other idea was to add the acid, in this case a lemon rind, just at the last moment so as not to cook it too long at high heat; another process that can cause discoloration. Finally, today at the Farmer’s market I bought beautiful berries. I want to share a tip that I use often. 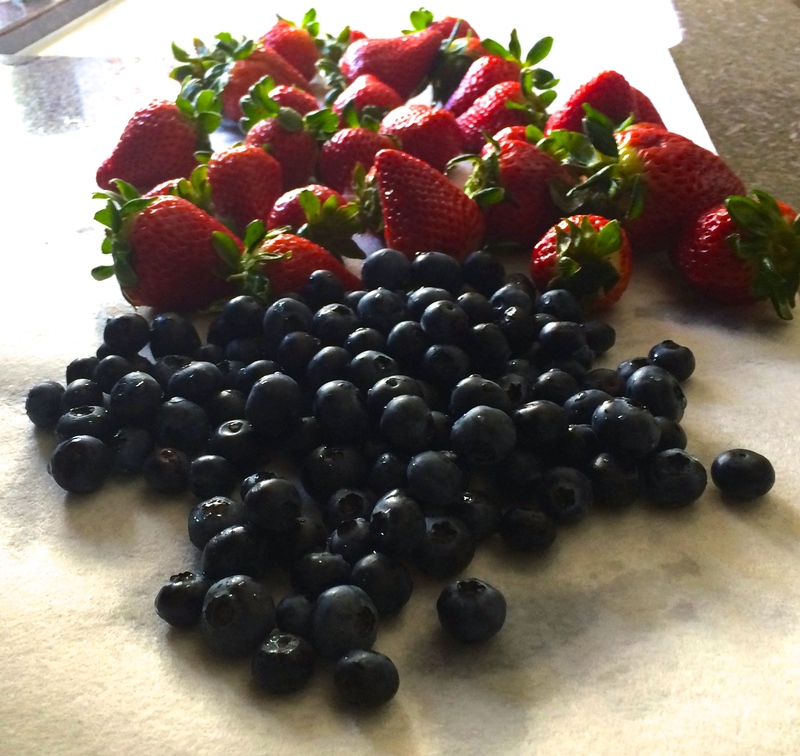 Rinse your berries in a solution of one part white vinegar and two parts cold water. Let them swirl in the water for a couple of minutes. Rinse them thoroughly in cold water and lay them out in a single layer on paper towels to dry. Store them layered with paper towels in a covered container in the refrigerator. They will last at least a full week. I have to be honest I don’t remember where I heard this tip but it works like a charm. I hope you will make the marinara and try something new. Let me know how your marinara tastes. Use the hash tag #trysomethingnew. Send me your tips, too! Put tomatoes in a medium bowl and crush with your hands or scissors. Rinse the can with ½ can of water and add to tomatoes. Heat 1 Tablespoon of the olive oil, sliced garlic and ½ teaspoon salt in a dutch oven, over medium heat. Heat until garlic starts to sizzle, slightly. Watch carefully, you do not want the garlic to burn. Add bell pepper and cook until soft. This should take about 5 minutes. Stir occasionally. Add the crushed tomatoes and the liquid. Add the whole basil leaves and bring to a boil. Reduce heat and simmer. Stir occasionally until the sauce is thickened, approximately 45 minutes. Be sure to check and stir, you don’t want the bottom to burn. Once it is thickened, use an immersion blender to puree to desired consistency. I like mine a more coarse but you can have it smooth if that’s your preference. You can serve immediately over pasta. Garnish with chopped fresh basil. You can also cool completely and put in jars. Store in refrigerator for up to a week and in the freezer for up to 3 months. This recipe will make about a 32 ounces of sauce. *see notes in the body of the post.